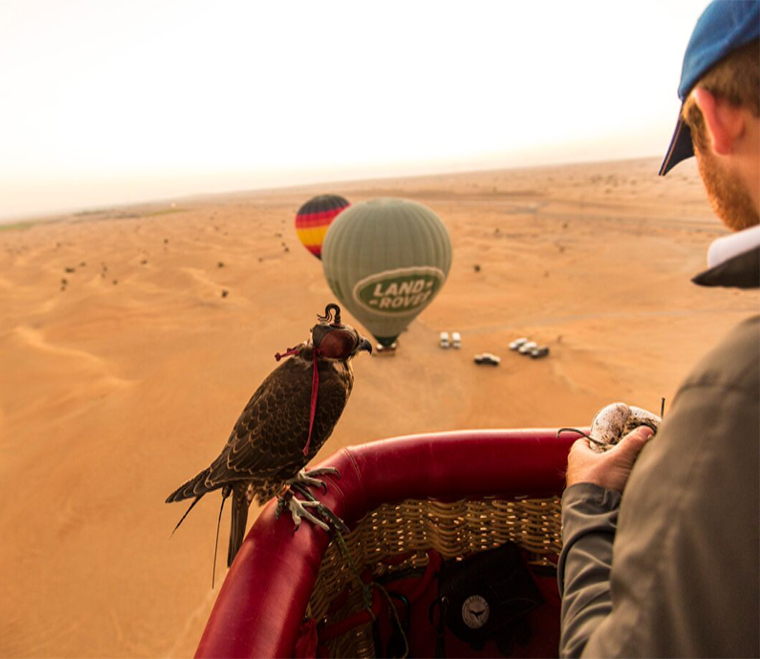 Enhance the hot air balloon experience by adding on a wildlife drive in vintage Land Rovers in the Dubai Desert Conservation Reserve. After the sunrise hot air balloon ride and in-flight falcon show, head to a Heritage camp for a delicious breakfast. The desert adventure doesn’t end there as you hop back into the 1950’s Land Rover for a wildlife drive. Spot native animals like Arabian oryx and gazelles and learn all about the desert fauna and flora. The adventure starts before sunrise when we pick you up from your hotel in Dubai. We will head to the take-off point in the desert – not more than a 45-minute drive from the city. As you arrive, the ground crew will be preparing the balloon envelopes and baskets. After a quick safety briefing, you will gather around the balloon basket while your Pilot begins the thrilling process of inflation. When the balloon is ready you will climb into the basket and before you know it, you will begin to peacefully float off the ground into the sky. One of the best sensations is when you start to rise and enjoy the amazing feeling of floating as we ascend to over a kilometre above the Earth (that’s 4,000ft to the metrically challenged). Every airborne adventure on a Hot Air Balloon is different, but there are always plenty of “National Geographic” photo opportunities. Our skilful Pilots will first fly high for a spectacular vista and then come back down for what we like to call a magic carpet ride (after all, we are in Arabia!). Experience a world-first phenomenon and fly with falcons at 4,000ft. 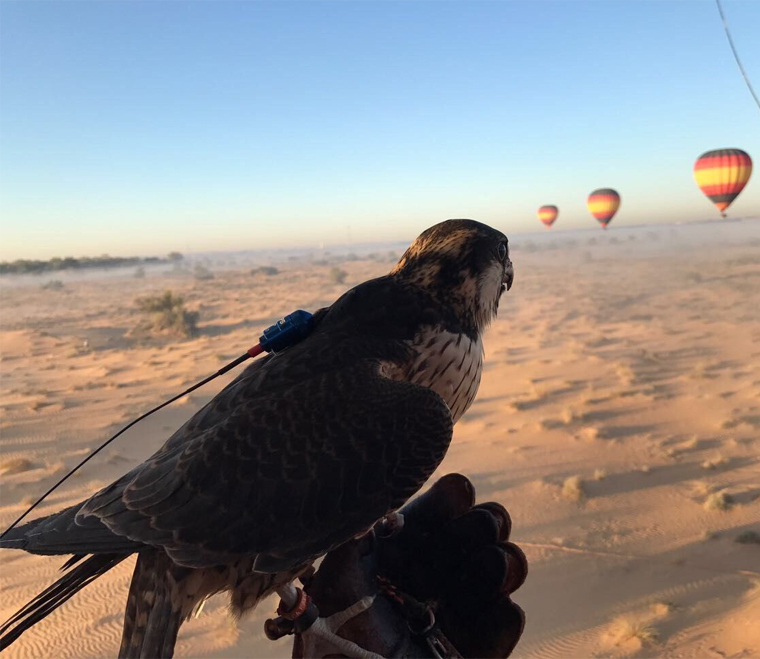 During the flight, our falcons fly against the incredible backdrop of the Dubai desert. As the sun rises over the Hajar mountains, your jaw will drop and even the hardest, toughest guys will feel all misty and emotional at the sheer beauty. We may have to issue a warning on whom you should take with you, as it’s very romantic. You may start cuddling up to your mother-in-law if she’s within arms reach! 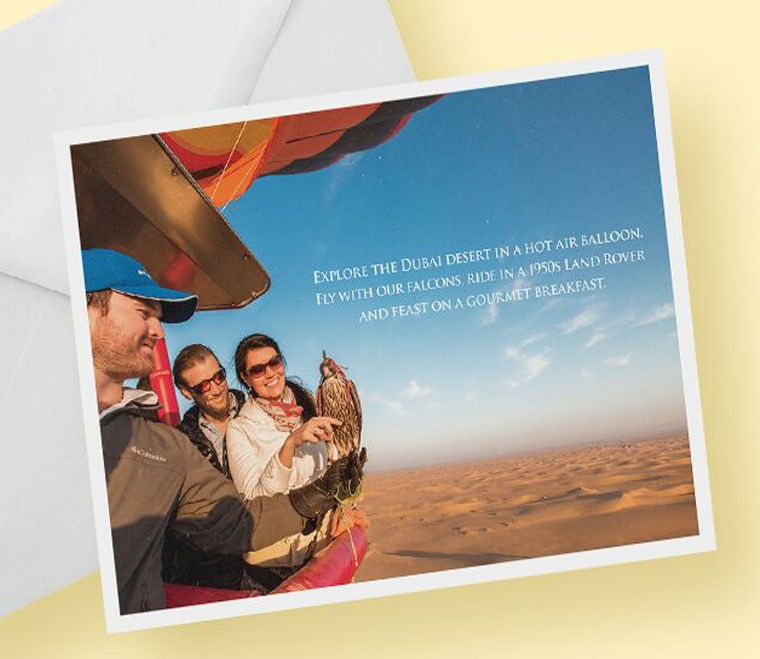 The balloons travel with the wind and therefore land in a different spot in the desert every day. Before you land, your Pilot will show you how to attach the clips of your belts to the basket and. You will embrace the landing position wait for the Pilot to let you know when it’s the right time to climb out the basket. After landing you will get a chance to watch the other balloons land and hold the falcon you shared the skies and basket with. After the hot air balloon adventure, you will experience a ride in historic open top 1950’s Land Rovers, to an authentic Heritage camp in the desert. Here you will have the chance to freshen up at clean, private bathrooms. Feast on an awesome breakfast that includes caviar, smoked salmon, Eggs Benedict, fresh fruit and so much more! After breakfast, embark on an adventure in the Dubai Desert Conservation Reserve on a wildlife drive in vintage Land Rovers. Spot native animals like Arabian oryx and gazelles and learn all about the fauna and flora of the Dubai desert. Your Conservation Guide will share stories of the desert and how this thriving ecosystem survives. You will soon see how the desert is teeming with wildlife! Drive on set tracks through the golden sand dunes and stop along the way at a Ghaf tree forest.